Congratulations on finding the Green Valley Directory online. 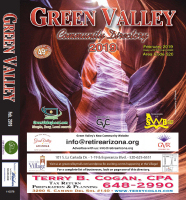 For over 48 years the printed version of the Green Valley Directory has been the resource that Green Valley residents turn to when looking for local goods and services, and it remains the most popular business directory in Green Valley. SWB Group will continue to print and deliver the Green Valley Directory for years to come, however, searching for local goods and services online in Green Valley can be frustrating so SWB Group has launched GreenValleyLocal.com. GreenValleyLocal.com is the Green Valley Directory online in a searchable format. GreenValleyLocal.com. allows consumers to search for local businesses in Green Valley by name or business type.